J'ai trouvé ce t-shirt de la marque Heroine à la boutique Off The Hook ce week-end. J'ai longtemps hésité entre celui-ci et un autre avec une image de Karl Lagerfeld. Finalement j'aimais plus le look oversized du Yves (il ne restait plus de small hehe). I found this t-shirt by brand Heroine at the Off The Hook store last week-end. I hesitated for a long time between it and another shirt with an image of Karl Lagerfeld. Finally I chose the oversized Yves (no more small size!) which I liked the fit better. 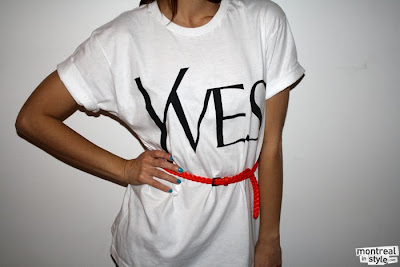 ile st super canon ce t shirt j'adore!!! ok ! JE LE VX ! 34$, mais fais vite il en restait 2 ou 3 quand je suis allée dimanche!